First Order of “Bizzy-ness” (as Coco would say). Another fun episode of “Rescue My Renovation!” is on Wednesday Night on DIY at 9ET you Lovelies!! Please tune in as I dole out a super cool new Kitchen and Dining Room AND Bathroom for a deserving family! Ok- now we can move on to the food. 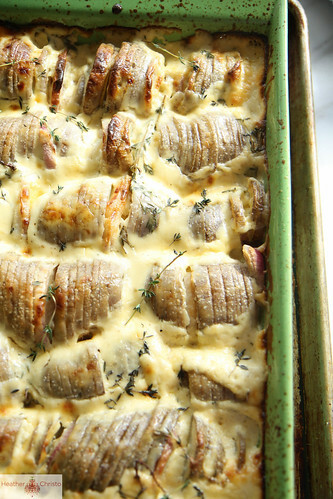 So when we were growing up, our traditional Easter dinner was a ham and Cheddar Au Gratin Potatoes. 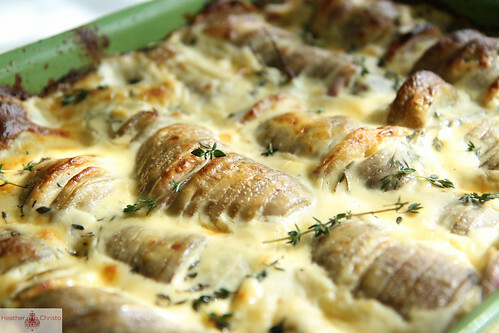 I have a great recipe for “grown up” Au Gratin Potatoes with fancy non yellow cheese. And it is really delicious. But now that I updated the ham, I thought I could do an update on the classic cheddar au gratin potatoes too. I actually kept it pretty simple by leaving the skin on the potatoes. So we are talking, rinse, scrub and slice. Fast. No peeling torture. No Mandoline-cutting off your fingers/knuckles required. I stuffed some shallots in between the layers and quite a bit of fresh thyme. Then I made a really basic cheesy cream sauce. 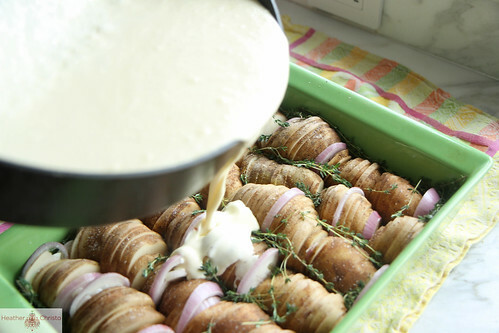 While simple, it bakes into a silky creamy, cheesy custard that melts in your mouth. I know it is obscenely fattening. I really have no defense. Except it is Easter, so it’s a special occasion dish, right? Plus, this pan served 14 people the other night at dinner, so really, lets just cut the cream into 14th’s before you freak out. ok? Blue Cheese Biscuits as promised tomorrow, in case you make this freaking CRAZY good ham. Also, Friday I am posting the most drool worthy sweet thing I have had in ages. Please tune in. Preheat the oven to 350 degrees. In a 9×13” pan, lay the potatoes in rounds side ways across the baking dish, until you have filled the whole pan with rows. 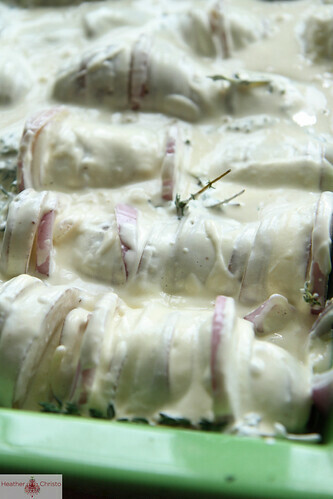 Squeeze the shallots in between the layers of potatoes with little bits of fresh thyme. Generously salt and pepper the potatoes. To make the cheese sauce, pour the cream into a saucepan and bring to a simmer. Pour the cream sauce over the potatoes and then just sort of shake the pan a little so the cream sauce sinks into the dish. Bake the potatoes at 350 degrees for 1 hour until the top is golden brown and bubbling and the potatoes are tender. 2. In a 9×13” pan, lay the potatoes in rounds side ways across the baking dish, until you have filled the whole pan with rows. 3. 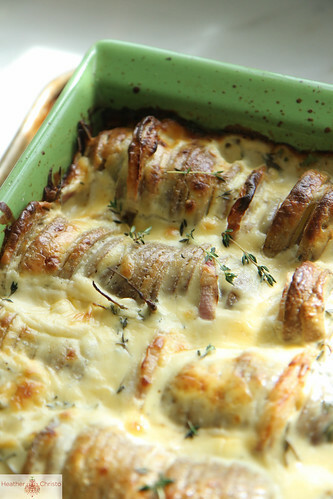 Squeeze the shallots in between the layers of potatoes with little bits of fresh thyme. Generously salt and pepper the potatoes. 4. To make the cheese sauce, pour the cream into a saucepan and bring to a simmer. 6. Pour the cream sauce over the potatoes and then just sort of shake the pan a little so the cream sauce sinks into the dish. 7. 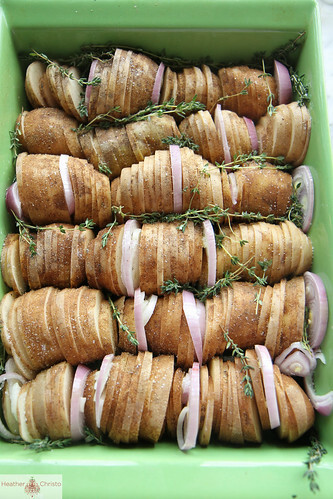 Bake the potatoes at 350 degrees for 1 hour until the top is golden brown and bubbling and the potatoes are tender. Seriously?? I am ready to dive in! How amazing is this?! I am drooling at 7am! Love! I have completely died right now. 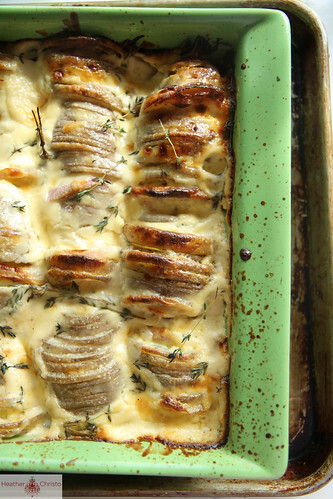 Cheese and potatoes were meant for each other and this looks like a great way to enjoy them together! Oh, the pictures, the pictures! My mouth is watering. I completely agree about the mandoline. I have a lovely scar on the palm of my hand right below my thumb where a mandoline took out a big slice a few years back. I respect the mandoline now! me too. I had part of my thumb “glued back on” after an incident a few years ago! Holy Heaven! 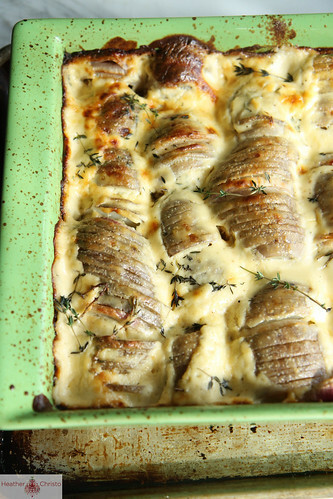 What a fantastic splurge dish! wow, look at all that cheese! seriously, potatoes and cheese are one of my favorite guilty pleasures. don’t mind if i pull my seat up to your table, Heather!! Now this is comfort food at its finest!! I think you’ve nailed it! Truly killer. Oh how exciting! I’m in Canada but I will try and find the show! Congrats! 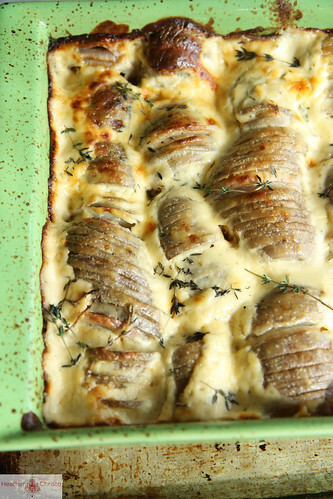 These cheese and cream potatoes look to die for btw! This looks so freaking tasty!! LOVE! made these for easter and they were a huge hit! your recipes never disappoint! Thank you! oh thank you Shari! that is so great to hear!! I made them for Easter & YES I will be making them every Easter now. These look heavenly. Love the look of the potatoes arranged that way also. you could use whipping cream or heavy cream. They are both delicious- the heavy is obviously just a touch more decadent. WOW! Fantastic Heather! Happy New Year! This is totally my style Heather! Love when I don’t have to peel (the potatoes or my fingers). Courtney! Ouch!! but, yes, I know what you mean! I know just by looking the they will taste great! Thanx for the recipe. This looks delish! Can this be made ahead, stored in the fridge, and then baked? We have a tradition of going to the movies and then having dinner on Christmas so I’d like to just pop it in the oven when we get home. Thanks. Can I make this a day ahead and cook it the next day? Hi Sheila- I wouldn’t leave it uncooked- the potatoes will turn gray? Maybe bake and then reheat? or I would make the day of. Thank you. For my Valentine dinner for 8. Have a great day!! !